If you thought you were done hearing about Starbucks' holiday cups -- and the inevitable complaints or conspiracy theories they spawn -- for at least another year, then it turns out you may be wrong. That's because the coffee empire just launched a second new holiday cup for current Peppermint Mocha-sipping season that will temporarily replace the innocuous color-in cups it introduced earlier this month. This time, they're red. 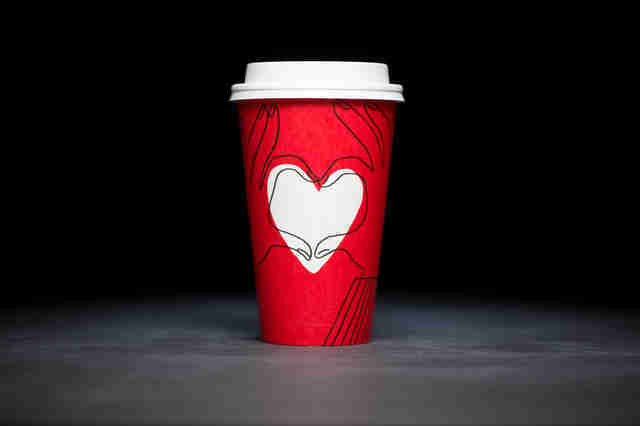 Starbucks officially announced the holiday cups on Monday night and said the "heartwarming" new design is meant to encourage people "to recognize those who fill their heart and embody goodness this holiday season" by treating them to a coffee drink. The cups feature a white heart that's cupped (no pun intended) by two hands coming together, where you can write someone's name before you surprise them with, say, a Toasted White Chocolate Mocha. Starbucks said it will serve drinks in the new cups for a limited time at its locations around the world, then will presumably switch back to the main holiday cups that you can customize by coloring yourself. Critics have decried the original 2017 holiday cups in recent weeks for allegedly promoting a "gay agenda," largely thanks to a BuzzFeed story that branded them as "totally gay," according to a report by The New York Times. Yes, it's as if the news cycle this year wasn't tiring enough. 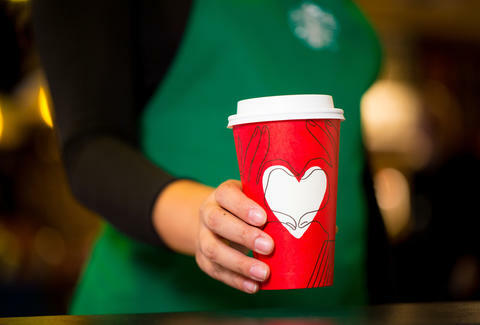 "The red cup is a clean design, with the heart as a space where people can highlight someone in their life who makes the season special," Leanne Fremar, executive creative director at Starbucks, said in a statement. "The design symbolizes the love and warmth felt during the holiday season, when we connect with friends and family." Of course, you can always just scribble your own name in the middle of the heart after you treat yourself to a $5 holiday drink. After all, you have to hear about Starbucks' holiday cups again. Tony Merevick is Senior News Editor at Thrillist and strongly believes it's what's inside the cup that's most important. Send news tips to news@thrillist.com and follow him on Twitter @tonymerevick.